Looking for something to do on a rainy day in Cleveland, Ohio? Or maybe you just generally want something fun to do? If so, then check out BOSS Pro-Karting! 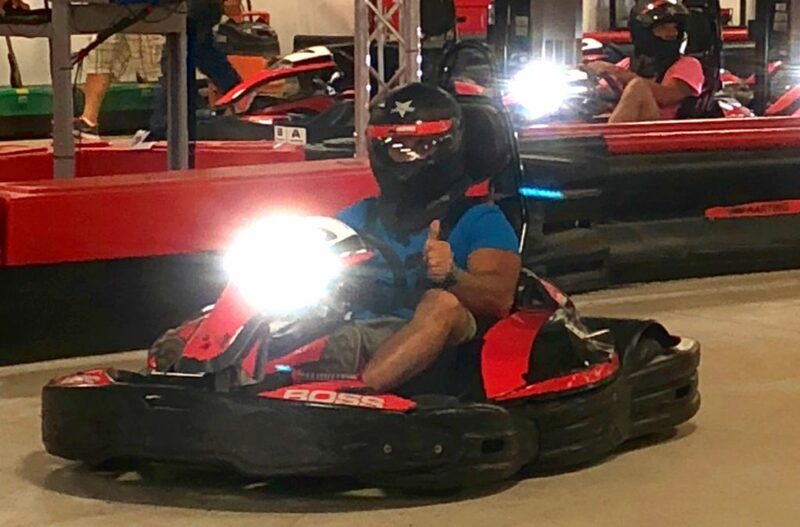 I got the opportunity to burn some rubber as part of the Cleveland Corporate Challenge event, but anybody can try their hand at go karts during their open racing “Arrive and Drive” sessions. 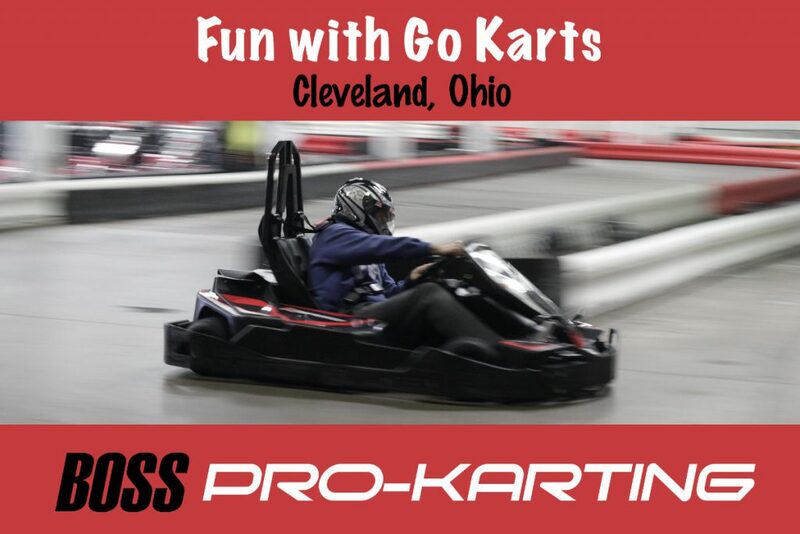 Find out everything you need to know about spending an evening doing go karts in Cleveland at BOSS Pro-Karting! BOSS Pro-Karting provides visitors with the opportunity to step just outside their comfort zone and push their limits in a safe and controlled environment. 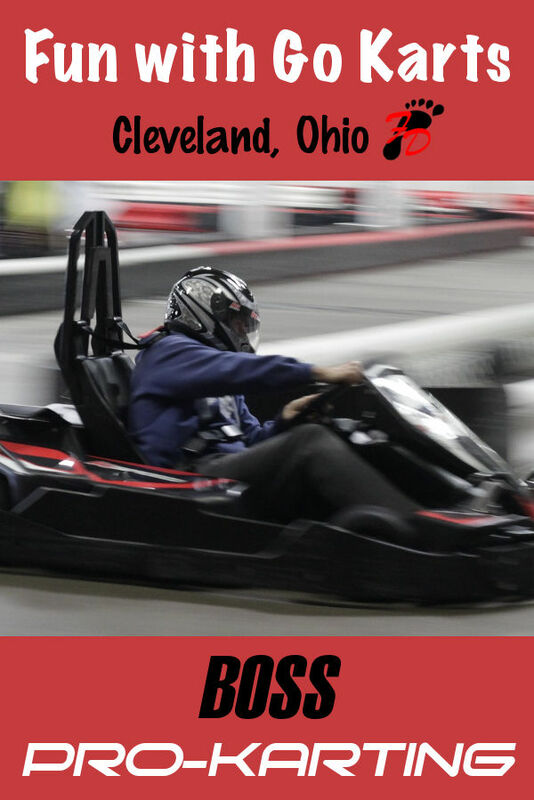 As I mentioned above, I got to try go karts at BOSS Pro-Karting as part of the Cleveland Corporate Challenge, which is a little bit different than if you were to just show up for open racing. There were 26 different teams who participated in the event and 4 people per team, 2 male and 2 female, for a total of 104 competitors. The goal for qualifying races was to have the fastest time for completing a lap. Depending on your speed and whether or not they have to stop the karts (there was a crash, kart broke, etc), you could typically get about 6 laps in per race. This meant that you probably had about 12 laps (or chances) to get the best lap time you possibly could. With this setup, you weren’t competing just against the people you were racing with. You were competing against all 103 other competitors. Once all of the qualifying races were completed, the officials took the best lap time for each team member and added them to create the team score. The top 8 teams with the lowest score (fastest time) would move onto the Championship Race. Unfortunately, my team came in 9th. We were just short of making it to the championship! Had we made it, we would have had to pick one team member to represent us in the Championship Race. This race would be position based instead of time based, meaning that you would want to be the first person to cross the finish line. Open racing ranges from 1 – 10 people per race (depending on how busy they are) whereas the Corporate Challenge Event always had 8 people per race. Beyond the above mentioned points, the racing experience is pretty much the same. 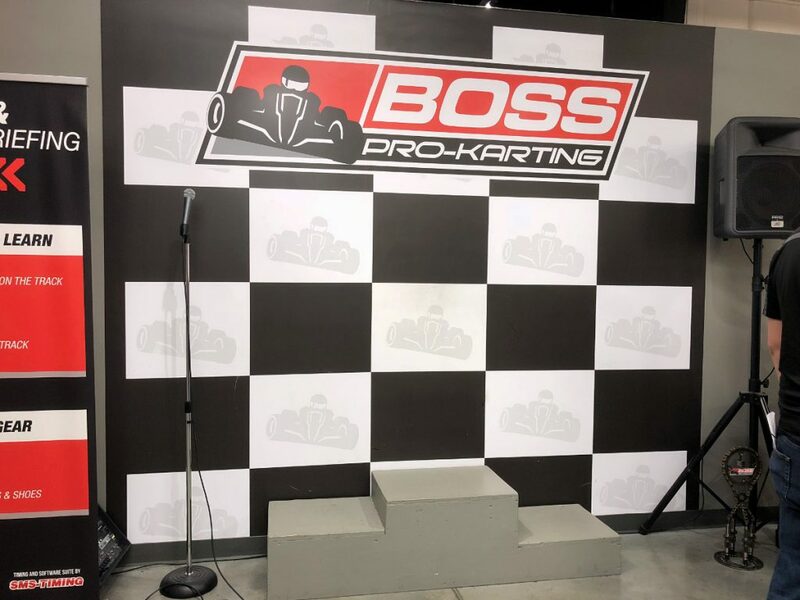 If it’s your first time visiting BOSS Pro-Karting, you’ll have to register. You can save time by registering in advance on their website. Once you’ve registered, they’ll give you a “head sock” that you’ll wear under your racing helmet (to prevent things like lice). They’ll also take your photo and combine it with your registration information to create your “profile”. This will follow you throughout your races. What do you mean it will follow me? BOSS Pro-Karting has an advanced computer system that can track each individual kart down to 1/1000th of a second. Instead of letting you just pick whichever kart you would like, they assign you (and your profile) to a particular kart. This allows the track timing and scoring system to save your results to your profile, giving you immediate feedback on how you did (you can also get these online on the BOSS Pro-Karting website). For this reason, it’s important that you get into the kart that was assigned to you. If you have to switch karts in the middle of the race because something happened to the one you were driving, the staff will transfer your profile to your new kart, so you can still keep track of your stats and times. Once you are all registered, you may or may not have to wait to get in a race, depending on how busy they are. If there is already a race in progress, take a seat at one of the tables or on one of the couches, and check out the race. Watching other racers, when they turn and when they brake, will be helpful for when it’s your turn to race. When it’s your turn, you’ll see your profile picture displayed on the TV above the race preparation room along with the pictures of those you’ll be racing against. Grab your head sock and head through the door! There, you’ll get a “briefing” that covers the basics of the kart such as how to reverse and an idea of how to navigate the course. Thankfully, the kart has all sorts of adjustments to make you comfortable. The seat not only moves back and forth, but even the pedals can be pushed forward or back (so me at 5’0″ had no issues reaching the pedals). The steering wheel can also be moved up or down. Once you get in the kart, however, you’ll find that making those adjustments aren’t the most intuitive. To move the seat forward or back, there will be a red strap between your legs that you will have to pull. On the steering column, there is a big red button you’ll have to pull out in order to move the steering wheel up or down. Just a little below that to the right is a another smaller red button that you can push to adjust the brake and gas pedals. If you can’t remember all that though, it’s okay, because a staff member goes around to each person individually before the race to help you with any adjustments. The karts do not have power steering, so don’t be surprised to find that the wheel will be relatively hard to turn (in comparison to turning the wheel of a regular car). However, you’ll also find that turning the wheel will be less difficult the faster you are going. According to the BOSS Pro-Karting Facebook Page, karts can exceed 50 mph, but I don’t think anybody in the Corporate Challenge Event got even near that speed. Obviously I didn’t have a radar gun, but I’d guess competitors managed to hit about 30 mph on the straighter parts of the track. Teammate Joe ready to go! As part of the Cleveland Go Kart Corporate Challenge, I went through two different driver briefings. In the briefing before my first qualifying race, they mostly just explained how everything worked, and the basics of what to expect on the track. Along the track, they’ll have a few signs that say “Brake.” Those are there to remind you that you are coming up on some of the harder turns of the course. Braking might seem counterintuitive when you’re trying to get the fastest lap time, but braking at the correct moments for the correct length will actually help you clear corners better and improve your lap time overall. There will also be several staff stationed throughout the course. They’ll have various flags and signs to give you information along the way. Some of the signs and flags may remind you to use more brake or be less aggressive while others will give you a heads up such as when a person is coming up behind you. This is useful because the racing helmet doesn’t always allow you to see everything that is going on around you. You’ll also find several pairs of black dots throughout the track. They called these “gates.” Going through them ensures you are on the path of the fastest line around the track. In the driving briefing before my second qualifying race, they went into the more technical aspects of the track. They noticed that many of us were struggling with one particular turn and were bumping into one of the side barriers (which also reduces time). They broke the track down into sections, specifying exactly where to look and when to start turning the wheel in order to help us clear different parts of the track as fast as possible and get us lined up for the next section of the track. I highly suggest paying close attention when the staff starts giving these kind of tips, especially the ones that help you stay on the “fast line.” Most of us reduced our lap speed by at least a couple of seconds after the second briefing. When it comes time for the race, you’ll find that all of the karts will be in a single file line when you get in them. Once the staff does their checks and gives you the go ahead, you will file onto the track one by one. At this time, the karts are set to go rather slow. Since you are racing against the clock (not each other), it’s recommended that you let the person in front of you get a little ways onto the track before you start to go. 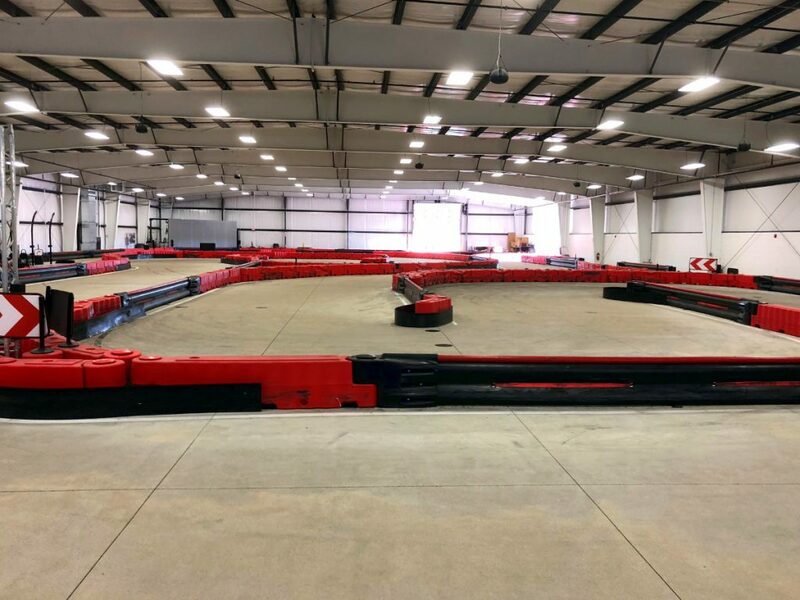 This way, you will have some space to efficiently go through the track without slamming into other drivers (which reduces your speed and increases lap time). As you begin to make your way around the track, the kart will begin to pick up speed. You’ll find that it hits maximum speed around your second lap. Until that point, I suggest using the time to get familiar with the track, where you’ll need to slow down, and where you’ll have the opportunity to floor it. Teammate Jen hitting the track! As the staff will mention, the key is to be smooth. Not only will being an aggressive driver reduce your speed and increase your lap time, but it can also be dangerous. If you hit somebody hard enough and at the right angle, your kart will actually go up onto the side of theirs (we witness this during one of the early qualifying races). 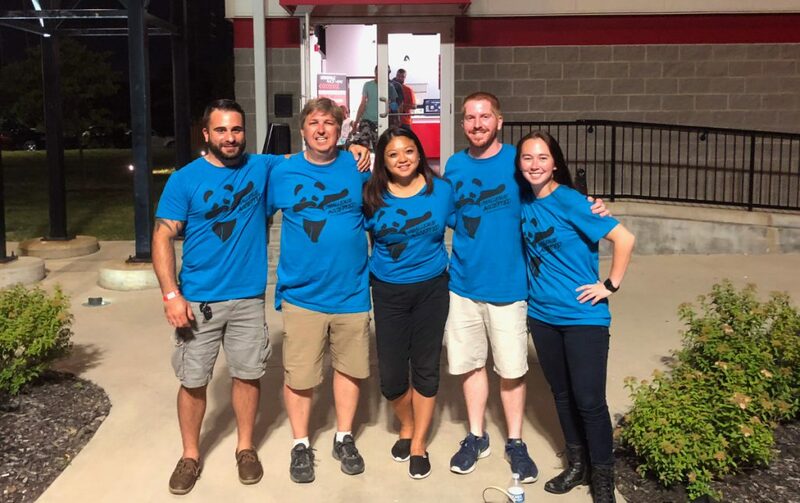 Of course, BOSS Pro-Karting has put a lot of time, effort, and money into ensuring that these races are conducted in a very safe environment. All racers have gear to help protect them and safety barriers line the track as well as the karts themselves. However, getting hit by another racer can still be a bit jarring. During my second race, I was rounding a corner with two other racers. The first racer behind me bumped my back end slightly as they tried to pass me while we rounded the corner. In general, that’s not a big deal, but that slight bump knocked me more into the center of the course, right into the path of the second racer who was coming up on the turn. They didn’t have a chance to turn, and T-boned the side of my kart at a pretty high speed. It not only shook me pretty good, but it knocked the entire plastic side panel off my kart, exposing all the wiring underneath. Of course, the staff quickly shut down all the karts and ran over to ensure that I was okay. When I told them that I was all good, they removed my kart from the track and brought me a different one. Once the adrenaline wore off after the race, I definitely started to feel the aftereffects of getting hit like that. The racing gear had prevented my head from getting jostled around too much (although my neck did feel a little stiff and sore), but I could really feel it in my back. I have some nice bruises right along my shoulder blades that are pretty sensitive to the touch. All in all, I walked away pretty unscathed, but I would definitely rather not get hit like that again. I was ready to burn some rubber! The silver lining in this is that, when the staff gave me a new kart to finish the race, they forgot to switch my profile over to the new kart, so the rest of my lap times didn’t get recorded (the printed scores only showed me as having completed one lap while everybody had done about six). When I brought this up to them, they apologized and squeezed me into the last race of the night, so I actually got to do a third qualifying race. Once the race time is up, a staff member will wave a checkered flag, signaling that you’ve completed your last lap. Once everybody has completed their last lap, the staff will once again reduce the speed of the karts so you can taxi back into the starting position. Once everybody is back in the gates, the staff will give you permission to exit your kart. After you put your racing gear back, you can head over to the TV to see how you did. Despite the crash, I had an absolute blast and would definitely do it again (although I may give myself some time to recover before heading back). It definitely gets the adrenaline going. I’ll admit, I walked into the facility pretty sure that I was going to be awful at racing (which was a stupid assumption considering my driving school teachers liked to call me the next female Nascar driver) but with the helpful tips from the staff and encouragement of my teammates, we did pretty well (even if we did come just short of qualifying for the Championship Race). Personally, I think 2 races is a good number for people who are new to go karts and not used to intensive activities. For those who are used to activities that are straining on the body (think dirt bike or ATV riding), they would probably enjoy doing 3 to 5. Also, I have to say it was a little weird getting back in my car when I went to leave. The steering wheel is super sensitive, and after driving the no power steering go karts, I had to remind myself not to yank on the wheel when turning! Teammate Joe ready to tackle the track! BOSS Pro-Karting will provide all of the equipment you’ll need to race. All you need to do is show up. The two required items for racing are the helmet (along with the head sock to go underneath) and the neck brace. There are several different sizes for helmets, ranging from Small to XXL. You can also bring your own helmet, so long as it’s DOT (Department of Transportation) approved. The neck brace is one size fits all, because it’s design to fit under the back of the helmet (so it doesn’t matter if it hangs down a bit in front of you). Having the neck brace prevents your head and the helmet from being jostled around, reducing the possibility of whiplash and neck injuries. You’re also required to have closed-toe shoes while racing. If you forgot and wore sandals, they have racing shoes you can borrow. They also have full racing suits if you’re interested in trying those out. Because go kart racing can get a little fast and competitive, there are several rules and requirements to ensure your safety. BOSS Pro-Karting is typically open 7 days a week, and is even open on some holidays. Because the track is mainly indoor (they have a small outdoor portion that is open during good weather), they are open year-round. Hours vary by the day of the week. There is a one-time fee of $6 for all drivers required once a year. You will receive a head sock the first time you race at BOSS Pro-Karting. If you lose the head sock, or forget to bring it the next time you want to race go karts in Cleveland, you will have to pay for another one. Prices are as of July 16th, 2018. Please check their website for the latest prices. BOSS Pro-Karting hosts various events throughout the year (the Cleveland Corportate Challenge I did was one of those events). They also allow you to host private parties for events such as birthday parties, family reunions, weddings, and more. If you’re more local to the area, you could consider joining one of the racing leagues. These feature all sorts of races such as hot laps, heat races, and featured events. If you aren’t interested in the official BOSS Pro-Karting racing league, you can create your own league so long as you have a group of 10 or more. Are you ready to start planning your trip to Cleveland, Ohio? Looking for more Ohio travel inspiration?